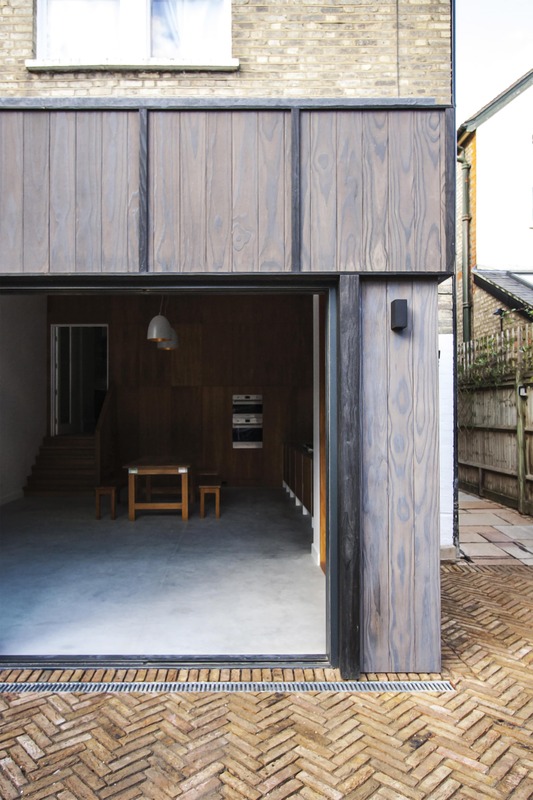 Studio Hatcham has designed a detailed rear extension, which extends a north London house located within a conservation area. What makes this so special? 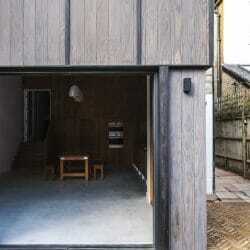 Their choice of materials and how they combine these with the spaces: both old and new. The talented and vibrant trio of young designers are creating stylish projects and they’re keen to explore the very edge of new materials. 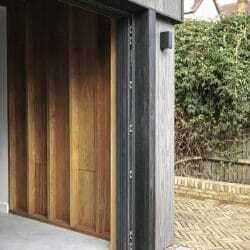 We come in with the exterior cladding, providing the timber which contrasts but compliments the existing property. 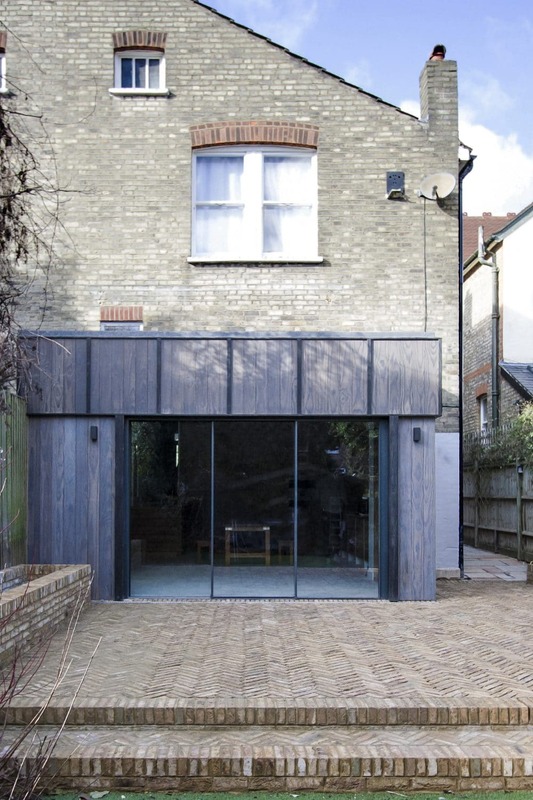 The Accoya wood cladding chosen to clad the extension results is an addition which is distinguishable and yet remains sensitive to the house; enhancing the pale brick property. The choice and configuration of this material are a stroke of genius. The use of three different grades of lightly charred Accoya to the external facades adds depth to these elevations, with framed sections of cladding sitting above the line of the sliding glazing. 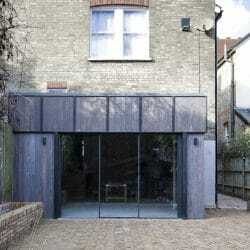 Blackened Accoya posts define and accentuate this opening, through which the terrace connects to the internal spaces. 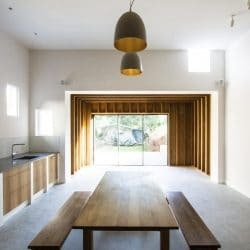 The studio was careful not to over-glaze the spaces, which would have reduced the areas of timber both inside and out, relying rather on carefully placed openings to light the interior. Small windows punctuate the room at different heights, allowing for a series of framed views to the garden and sky above. Internally, a brutal floor in a polished concrete, made up of greys and blues, is softened by the natural grain of the woodwork. 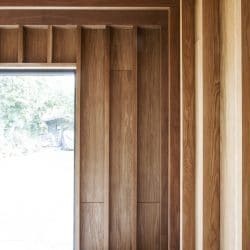 Furthermore, oak fins reach and continue across the ceiling of the extension, with timber panelling used through the spaces. The colour and texture of the herringbone stock that make up the terrace act as a perfect balance of colour and texture when transitioning from the concrete floor: bricks to one side, timber to the other. 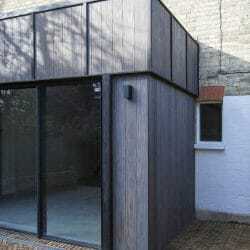 The cladding is manufactured by Exterior Solutions Ltd in three finishes, all of which are from Accoya® timber. The main structure of the cladding is delineated by Large sections of light Brush Accoya® “Shizen” – 自然. 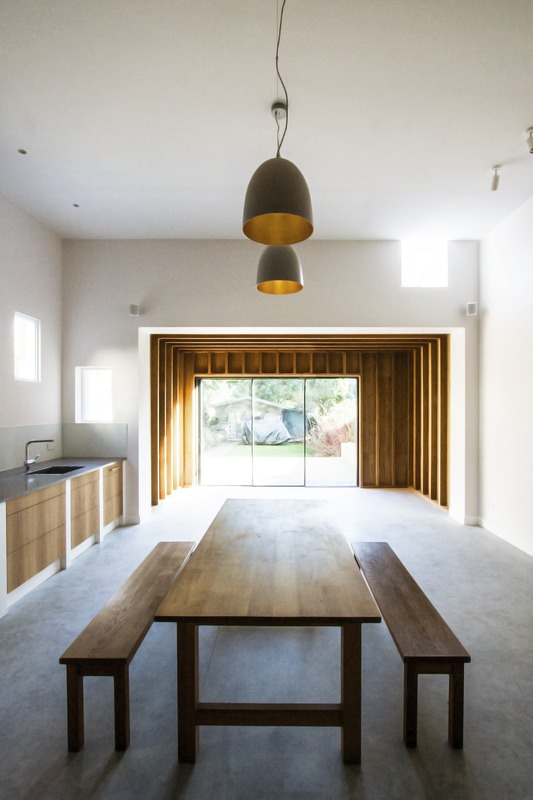 The lower vertical panels are manufactured in Graphite Accoya® “Seizō” – 製造. 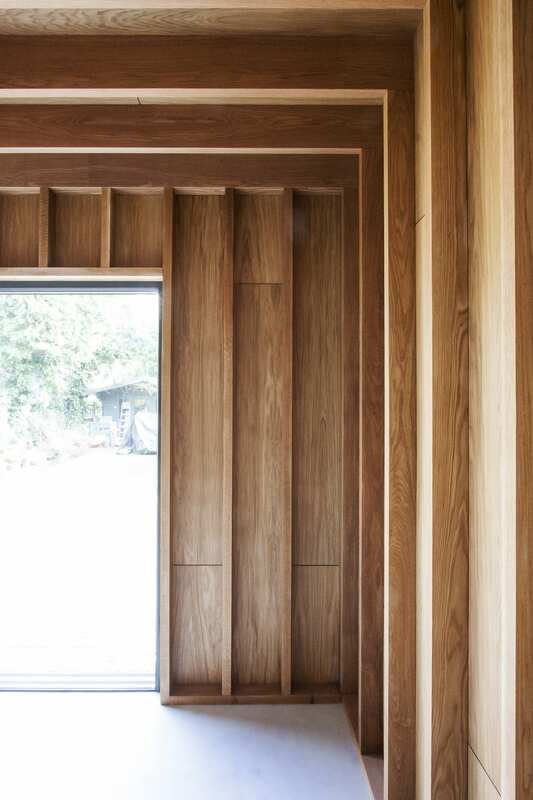 These are accompanied with Anthracite Accoya® “Gen no” – 元の cladding on the upper square panels. 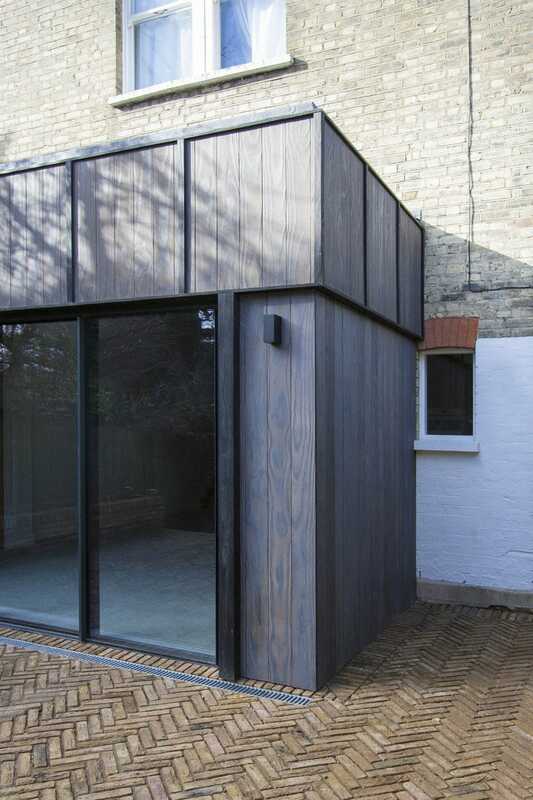 Accoya® charred timber cladding is certainly a champion amongst some strong contenders. However, in any competition in the timber world, a strong warranty must be in place. Accoya® has a 50-year warranty against rotting. 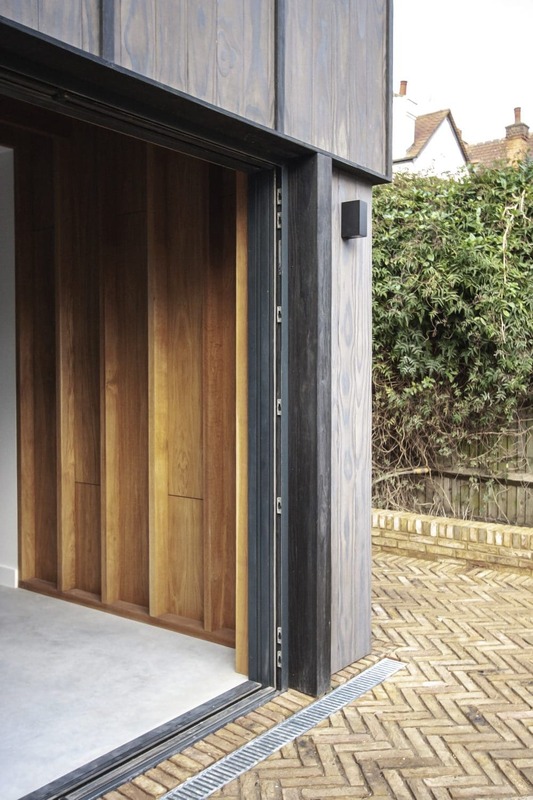 It also has a durability class 1 timber and has a service life in excess of 70 years… Also worth noting Accoya® has incredible stability and often used for doors and windows.